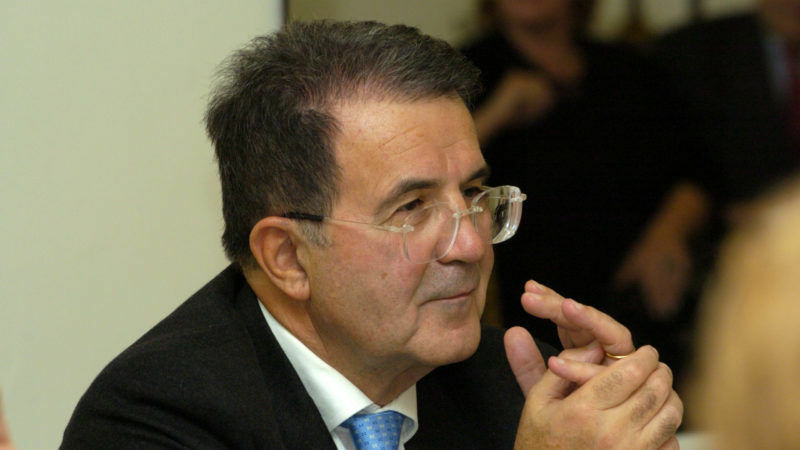 Romano Prodi was twice prime minister of Italy, from 1996-1998 and from 2006-2008. He was president of the European Commission from 1999-2004. Prodi was interviewed by Ouest-France’s Laurent Marchand. What is your first memory of the European ideal? When I was a child, the message that we received was very much one of peace. At school, this was really the spirit of the times. Just after the war, when we had to write about Europe – it may seem rather simplistic but this is how it was – we wrote about how enemies can become friends and how we can live better lives together. What was the first European country you travelled to? I was born in Emilia-Romagna and even travelling to Milan was a long way. My first real journey was to Germany, when I was 19, with a Catholic organisation. I worked as a builder for a whole summer. And what memories do you have of that time? We were working to extend an orphanage, I found myself in a completely different world. We have forgotten it now, but the effects of the war lasted a long time. There were young people from Poland, from the Sudetenland. I learned a lot. That was what Europe meant to us: rebuilding together. We rebuilt one little piece on our site. My attachment to Europe is directly linked to this personal experience. I saw where it started from. Is this still valid today? No. That is the problem. When I talk about peace to young people, they look at me as if I was some kind of dinosaur. They take peace for granted. Even though we tell them that never, since the fall of the Roman Empire, have three successive generations managed to live in peace. It will only change if young people once again feel the weight of a historic risk on their shoulders. Speaking as an Italian, I tell them with a smile that, if we are not united, we will be crushed. At the Renaissance, Italy was number one in everything: in technology, art, finance, the art of war. Then the first globalisation came, we remained disunited as a country and Italy disappeared from the map for four centuries. Precisely, today we are in the second phase of globalisation. The new frontiers are the tools we use every day, like Google, Apple, AliBaba, Amazon, etc. All these are American or Chinese tools. You were president of the European Commission when the EU was enlarged to include the Central European countries. Do you have any regrets? I am very disappointed by the behaviour of some of these countries. But I have no regrets. Think for a moment about if Poland had not joined the EU and today found itself in the same position as Ukraine. All the problems we have in these countries – the Orbáns, the Kaczynskis – are nothing compared to Ukraine. We have changed a lot of things for the better in these countries. What caused the split with public opinion? The management of the [2008 financial] crisis was disastrous in Europe, we stopped dead. The crisis of the traditional political parties has the same origins. The problems arose because we were not up to the challenges we faced. What would you have proposed? I would put all my effort into avoiding the crisis in the Commission, which is the organisation that represents Europe. This is where the idea took hold that we are no longer a real union but a collection of nation states where the strongest are in charge. We have seen the progressive rise of Germany, the withdrawal of France and the suicide of Great Britain. Do you think Germany is too dominant? Yes. And I have said so several times. I have said that the rigidity of the Maastricht rules [limiting public deficits to 3%] is stupid. But I have always respected them nonetheless. As head of the Italian government, I reduced the national debt. This is unique in Italy. If Germany is strong, it is because it is virtuous. I have never said Germany should accept the ill-discipline of other countries, but that it should implement economic policies that can help them, generating greater domestic demand, which Germany badly needs, by the way, to cut its trade surplus. The European treaties also rule out excessive surpluses. That is the problem. It is also a question of leadership. What should a leading country do? How should it behave? I believe it should act in the common interest, harmonise the interests of all parties, in one way or another. Otherwise, it is not a real leader. Are you in favour of a multi-speed Europe? Yes. On questions of defence, for example, this could be France’s moment. After the 2005 referendum, we all asked: ‘Where is France?’ This is a chance for France to step up. It has the EU’s strongest army, a seat on the Security Council, nuclear weapons. It does not necessarily have to put all this formally at the service of Europe. That would be a big political gesture. A veto at the UN and a significant military strength can only weigh on the international balance of power if it is understood that there are other countries behind France. What is the big challenge for Europe on its 60th anniversary? We risk becoming marginalised. Trump is a strong symbol of this. He says, “You are incorrigibly decadent… your union is worthless… the Germans are oppressing you.” The messages of division that come our way from the United States should make us feel more acutely than ever the need to stay together. In a wide-ranging interview with EURACTIV.de, Romano Prodi, former European Commission President, says moves towards a two-speed European Union were now well underway. Regarding the UK's disengagement from Europe, his assessment is simple: Britain will lose influence and eventually face "grave difficulties". Re Prodi’s comment on Poland: In 1989 the Communist-controlled Opposition called Solidarity took power and immediately ensured that the corrupt elites that had sprung up under decades of Communism would continue to be rich and powerful. They had control over the judiciary, the political parties, the media, big business and the arts. These corrupt relicts of Communism are hailed by the EU as “Liberalism”. I don’t know why – I honestly don’t. They got voted out by an electorate fed up with corruption, lying media, but most of all by the lack of a social welfare system and robber capitalism with lots of worker exploitation and repatriated profits. Prodi talks about postwar reconstruction. Poland has benefited from trickle-down economics, but has not made the leap forward in its 27 years of illusory, foreign-owned freedom that France made after the war. Democracy means rule by the people for the people. The EU supports the corrupt post-Communist elite and hails these parasites as “Liberals” while the truth is they gave Germany businesses an economic colony.